This was the official first team meeting of the Panther/Competitive Cyclist racing team. We all meet up in Cincinnati OH for some riding and getting of the free bike stuff. It was good to get back with what was pretty much the exact same crew as last year’s Panther/RGF team. We had all the usual formalities of the first team meeting, going over the contract, expenses, major target races, and thanking the primary sponsor, Andy Clarke of Panther who is really setting our squad up nice. Then it was on to the good stuff, all the sweet swag we got! Competitive cyclist shipped all our stuff in gigantic bike boxes. Each box had a persons name and all their stuff: kits, bikes, etc. It was like Christmas opening up the bike boxes, you don’t really know what’s inside, what if we all got Panther team puppys? Unfortunately I asked my bike not to be built so I didn’t get to ride it around Cincinnati, which turned out to be a bit of an error on my part. First of all, because my rear shifter broke, turning my winter bike into a 2×1 road bike, and secondly because Cincinnati is hilly as crap. Once back home I was finally able to build up the Ridley, which by the way is only sponsoring one American racing team: Panther. Notice the brand new Crank Bro’s Quattro pedals, these are a rarity now and I will sell them to anyone willing to pay me $300. So I learned an important lesson with this bike, no matter how much I love my 32 hole low profile wheels, deep dish carbon wheels defiantly make your bike look way cooler. Previous Article← Winter is almost done!! What part of town did you ride in? And yes its obscenely hilly, there are still some hills I refuse to go up. Damn… that SRAM crank is money. 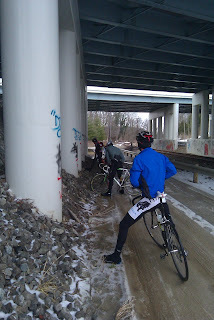 Todd – we stayed in that weird Indian Hill area, we actually rode by your sub at one point. I think for the most part we rode south east past 275.